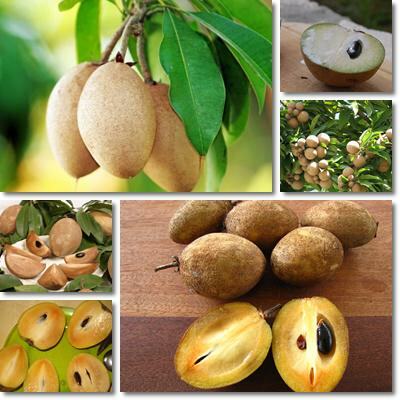 Zapota, sapota, chico, naseberry or sapodilla (Manilkara zapota) are common names denominating a popular tropical fruit native to Central America and the Caribbean islands. Sapodilla is a dull looking fruit but with potent antiviral, antibacterial as well as anti-inflammatory properties. It boasts a good vitamin C an iron content and is a rich source of antioxidants called tannins. Regular consumption is believed to protect cells against free radical damage and reduce oxidative stress. While it may cause a dry mouth sensation as a result of its saponins content, eating sapodilla has several wonderful benefits for the digestive, cardiovascular and immune system health. Sapodilla is a moderate source of non-heme iron, but ensures a good absorption rate thanks to its good vitamin C content, potentially helping manage anemia. It is also an excellent source of dietary fiber and thus ideal for relieving constipation, maintaining a healthy weight and lowering high blood cholesterol levels. Regular consumption is said to favor digestion, boost immunity and promote cardiovascular as well as colon health. The fruit has an impressive anti-inflammatory action and antibacterial and antimicrobial properties. What does sapodilla look like? As stated above, sapodilla is quite a dull-looking fruit. At first glance it might remind you of a shaved kiwifruit or a brown-colored plum. Different varieties differ slightly in terms of shape: some are rounder, while others are slightly more elongated or oval. Ripe fruit have a dull brown, rough-looking skin and at least two shiny, red-brown, bean-shaped seeds in the middle. Sapodilla pulp is yellow-brown colored, some say almost sandy and reminiscent of the pulp of a baked fruit. Honestly, it reminds me of baked quinces. What does sapodilla taste like? Unripe fruit are rich in saponins and thus have quite a bitter taste. If you chew on a slice of unripe sapodilla, you will feel it sucking all the moisture out of your mouth. Saponins are the ones responsible for the dry mouth sensation you get when eating certain fruits such as quinces or unripe sapodilla. Moreover, the unripe fruit may cause mouth sores, or canker sores. Ripe fruit are very sweet and should make a good impression on you when you try them for the first time. The texture of the flesh is a bit grainy, reminiscent of that of a pear, but nonetheless pleasantly sweet and savory. 1) Great natural laxative. With 5.3 g of dietary fiber/100 g of pulp, sapodilla makes a great natural laxative. Dietary fiber adds bulk to stools, helps with intestinal motility and regulates transit time, relieving constipation. This, in turn, has a protective effect on the colon lining, reducing prolonged exposure to toxins from waste material and promoting colon health. Furthermore, fruits rich in dietary fiber like sapodilla are ideal to eat for hemorrhoids, helping manage symptoms by relieving constipation (read more about what to eat for hemorrhoids). 2) Excellent cholesterol-lowering properties. As mentioned above, sapodilla is rich in dietary fiber (5.3 g), plant material that our stomach does not digest. Dietary fiber passes unmodified through the digestive tract and, when it reaches the intestines, along with the already digested food, it binds to the fats in the food. This reduces fat absorption considerably and indirectly contributes to lowering high cholesterol levels. 3) Good for weight loss. Again, the fiber in sapodilla prevents the intestinal absorption of certain amounts of fat from food, a process which contributes to weight loss. Basically fiber cuts down on the calories our body absorbs, despite having enjoyed a richer, fattier meal. And although sapodilla has 83 kcal/100 g, almost as much as a banana (89 kcal/100 g), its high fiber content makes it ideal for losing weight, of course, when part of an overall nutritious and balanced diet. 4) Supports digestion. Sapodilla consumption is very supportive of the digestion process. The fruit boasts great anti-inflammatory properties and helps soothe an irritated stomach lining. Consumption is recommended in cases of acid reflux, gastritis, even irritable bowel syndrome (IBS, a condition characterized by inflammation at the level of the gastrointestinal tract which affects digestion, nutrient absorption, intestinal motility and bowel function in general). Similar to quinces, it does not cause acidity and is even reported to calm digestive upset. However, considering it is a high-fiber food and foods rich in fiber are often bad for gastritis, it is best to eat sapodilla in moderation if you are suffering from gastritis (read more about the best and worst foods for gastritis). 5) Antiviral and antibacterial properties. Sapodilla is a good source of vitamin C, only 100 g of fruit supplying us with 24.5% of the recommended daily allowance. Vitamin C boasts excellent antiviral and antibacterial properties, increasing the aggressiveness of white blood cells in the fight against viral and bacterial infections. Also, vitamin C stimulates the production of collagen, the main structural protein in our body, responsible for blood vessel and skin integrity. Having enough of it in our diet means we don’t have to worry about wrinkles and enjoy a fast healing time of wounds. 6) Anti-inflammatory effects. Due to its high antioxidant content, vitamin C included, sapodilla helps reduce inflammation markers. Inflammation has been linked to a number of chronic illnesses such as diabetes, obesity, cardiovascular disease and cancer and keeping it under control constitutes the best long-term prevention against chronic illnesses. 7) Offers antioxidant protection. Sapodilla is a good source of antioxidants, notably tannins, vitamin C and copper. Antioxidants hunt down and destroy harmful reactive oxygen molecules called free radicals which may damage cells, causing them to mutate into cancerous cells. Also, antioxidants significantly limit the action of carcinogens, toxic compounds that disrupt normal cell activity causing cells to multiply uncontrollably and become cancerous. 8) Other benefits. The fruit has a fairly generous content of iron and can represent a good resource for managing anemia caused by iron deficiency thanks to its good vitamin C content which optimizes iron absorption. Moreover, its astringent properties (the dry mouth sensation you experience when eating sapodilla), can prove useful for relieving non-infectious diarrhea. Conclusion. Sapodilla is a moderately nutritious fruit with a high antioxidant content. It is a potent anti-inflammatory and antiviral agent with immune system boosting properties and beneficial effects on digestive and cardiovascular health. It has a soothing action on the stomach lining and a good overall vitamin and mineral content, although eating too much may not be good for gastritis sufferers who should limit their fiber intake. Sapodilla is generally considered safe to eat during pregnancy, but consulting a doctor first is best.